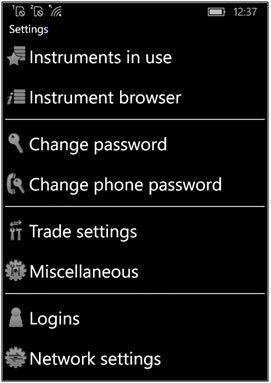 The "Instruments in use" and "Instrument browser" functions have already been discussed in previous sections of the manual. The "Change password" and "Change phone password" functions are self-explanatory. By the "Network settings" you can edit the connection composition and priorities for the IP addresses of the company's servers for Real and Demo accounts. Here the parameters that are used in the dialogue of opening a position, are set by default. if there is a tick mark in the "Use locks", you can use "Lock" regime in your operations, setting or switching off this regime in each operation. if there is no tick mark, you cannot use the "Lock" regime in your operations. in the "Default lock" field you can set "On" or "Off" for setting the Lock regime by default. In other fields of this window volume, order duration, trailing stop distance and deviation values are set by default for deals and orders. To finish you need to click "OK". 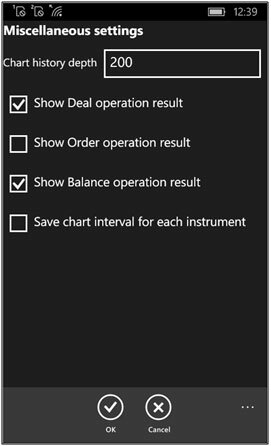 In this window you can set notifications for the operation results, chart history depth and the setting for saving chart interval per each instrument. if there is no tick mark when opening the chart the timeframe of any previous instrument chart is chosen. if there is a tick mark, the timeframe of the same instrument chart previously opened is chosen. 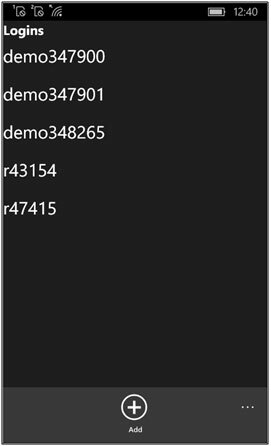 By choosing any preferred login in this window you can call the dialogue where you can edit the login, password or delete the login from the list. By the "Add" button you can add the new login.